Weakness of the Provisional Government, economic and social problems and continuation of the war led to growing unrest and support for the Soviets. Led by Lenin, the Bolsheviks seized power. The Bolsheviks were a revolutionary party, committed to the ideas of Karl Marx. They believed that the working classes would, at some point, liberate themselves from the economic and political control of the ruling classes. Once they had achieved this, a genuine socialist society based on equality, could be established. However, the Bolsheviks differed from the Mensheviks in that they believed that this revolution should move more quickly as the workers were not ready to rule themselves. Hence, the Bolsheviks would form a Dictatorship of the Proletariat to hold power until Russia was modernised. The Poletariat were the original supporters of the Bolsheviks and tended to be industrial workers. At the time of the February Revolution, which overthrew the Tsar, the Bolsheviks were still relatively weak. Most of their leaders, including Lenin, were in exile in Switzerland. The chances of the Bolsheviks ever attaining power in Russia seemed remote. But in late 1917, Bolshevik leader Lenin decided that the conditions in Russia were ripe for revolution. Lenin's energy and drive convinced the Bolsheviks to agree on this course of action. For the plan to work, it was necessary to increase Bolshevik support within the Soviets. Lenin developed Bolshevik policies with this aim in mind. These policies were outlined in his April Theses. Lenin declared “All power to the Soviets”. This showed that the Bolsheviks did not believe in the existence of the Provisional Government or an elected national assembly. The Bolsheviks declared that they would make peace with the Germans. However, the influence of the Bolsheviks was limited until Autumn 1917. The Petrograd Soviet was dominated by Social Revolutionaries and Mensheviks, while the Provisional Government remained in control of Russia. Lenin was actively supported by Leon Trotsky. In September, Trotsky became Chairman of the Petrograd Soviet and was head of the Military Revolutionary Committee. The MRC was established to protect Petrograd and allowed socialists to infiltrate the army. Trotsky had superb organisational and improvisational skills. His position in the Soviet allowed him to create the Red Guard. This was a Bolshevik militia, formed from armed factory workers, soldiers and sailors. 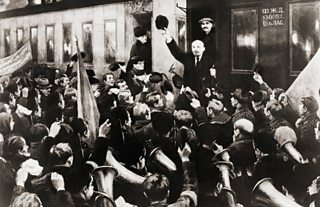 Lenin returned to Petrograd in early October, determined to seize power quickly. 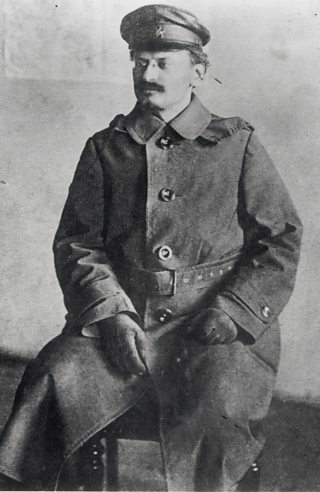 The Provisional Government had announced that elections would take place in November and he was certain that the Bolsheviks would perform poorly. Trotsky took charge of planning the Bolshevik coup that was intended for the end of October.